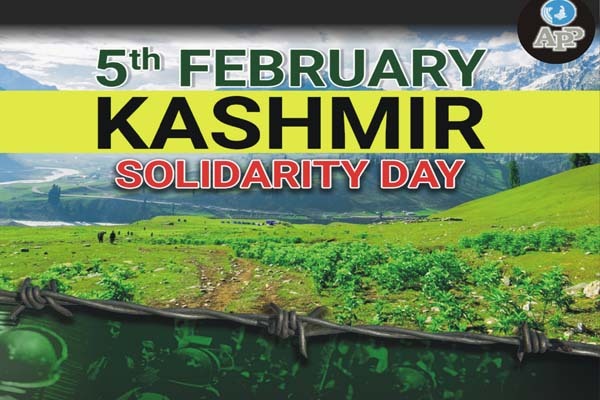 ISLAMABAD, Feb 3 (APP):This year, the Kashmir Solidarity Day is being observed in Pakistan and other parts of the world at a time when Indian atrocities in occupied Kashmir have reached a new level of oppression and human rights’ denial to crush the indigenous freedom movement against the subjugating forces. The height of brutality can be gauged that there is not even a single day that goes without bloodshed of innocent Kashmiris, particularly the youth, at the hands of Indian occupational forces. These Kashmiris are just struggling for their legitimate right to self-determination as promised by Indian forefathers (Pandit Jawaher Lal Nehru) and guaranteed and passed by the Security Council of the United Nations. It is alarming fact that an average the tyrant troops have martyred almost nine unarmed Kashmiri people every day since January 1989, when there was massive uprising against the Indian occupation all across the state. During a period of 30-year (January 1989-January 2019), India committed massive human rights violations and took lives of 95,283 Kashmiris, out of which 7,120 were custodial killings, besides its troops arrested 145,597 civilians, destroyed 109,205 structures, widowed 22,898 women, orphaned 107,756 children and molested 11,111 women, as per the data of Kashmir Media Service. Despite India’s full-fledged state terrorism, Pakistan remained steadfast and continued extending all possible diplomatic and moral support to the people of Kashmir to help them achieve their goal of right to self-determination. Besides, it effectively highlighted the importance of resolving the longstanding issue of Kashmir at international forums to ensure durable peace and prosperity in the region and rid the region of absolute poverty. The efforts started yielding some results as the UN High Commissioner for Human Rights Zeid Ra’ad Al-Hussein released first-ever 49-page report in Geneva on June 14, 2018, urging the UN Human Rights Council to consider a comprehensive independent international investigation into the HR violations in occupied Kashmir. “The people of Kashmir have exactly the same rights to justice and dignity as people of all over the world, and we urge the authorities to respect them,” the UN High Commissioner said. Addressing 73rd session of the UN General Assembly in September last, Foreign Minister Shah Mehmood Qureshi said there could be no lasting peace in South Asia without a just settlement of the Kashmir dispute based on the UN Security Council resolutions and the will of the Kashmiri people. “To divert the world’s attention from its brutalities, India frequently violates the ceasefire along the Line of Control in Kashmir. Despite numerous violations Pakistan has acted with restraint. But if India does venture across the LoC, or acts upon its doctrine of “limited” war against Pakistan, it will evoke a strong and matching response,” he said. The present wave of repression has entered in third year, since the martyrdom of veteran Kashmir freedom fighter, Burhan Wani on July 8, 2016. The reign of terror unleashed in IOK has resulted in 200 deaths so far, with more than 15,000 injured including about 1600 rendered permanently or partially blind by the pellet bullets showered on the innocent youth, women and children. Thousands have also gone missing after being kidnapped by the occupational forces and put to death after being incarcerated in the dungeons in and outside Jammu and Kashmir. Azad Jammu and Kashmir President Sardar Masood Khan, during a recent Kashmir Conference here, said Indian forces had made 6,000 Kashmiris partially and completely blind by using pellet guns. “The number of making the people of IoK blind is so high that there no such an example even during world wars,” he added. He said India had almost deployed half of its army in occupied Kashmir to suppress indigenous and unarmed struggled of people of Kashmir for their legitimate right to self-determination. All Parties Hyrriyat Conference (APHC) leader Abdul Hameed Lone said that Kashmir was purely a political and human issue and it should be resolved according to aspirations of the people of Kashmir. “It is not an issue of law and order, but a political and human issue involving the political future of the people of Jammu and Kashmir”. “The people are being put behind the bars, the arrest of youth is going on at a large scale and often the use of notorious pellet guns continues against Kashmiris,” he said. Spokesperson APHC AJK-chapter Syed Yusuf Naseem said that Pakistan always supported the Kashmir cause at every forum, which proved to be a morale-booster for the people of IoK facing Indian brutality and subjugation for more than seven decades. There is no denying the fact that Kashmiris’ struggle for freedom from Indian occupation has entered into a decisive phase as the youth of the region are spearheading the movement. These are not ordinary youth but well-educated and highly literate ones including Ph.D scholars, Engineers and other top ranking professionals. The existing young generation prefers freedom over their education and other goals; and this indicates towards the silver lining in the sky, showing that India could not stay long in Kashmir as the young generation of Kashmir is ideologically well-equipped to safeguard their interests and lead the nation out of Indian bonds, towards freedom, peace and prosperity.